We all know fairy tales...fairy tales are perhaps the most popular branch of literature in the world. Naturally, popular stories like those are written and re-written countless times, whether it's to brighten a gloomy tale or spark a boring narrative with some action and wit. There are also many collections (anthologies) of fairy tales, each story having been selected by a single editor or group of editors as a pointed example of all the themes the anthology is trying to convey to its audience. If there is an introduction to the book, it usually is very revealing in that respect. I have many favorite fairy tale collections, but one in particular always comes to mind first: The Outspoken Princess and The Gentle Knight. Every time I read this treasury or re-tell its selections for a skeptical listener, many memories remind me just what I love about it so much. First of all, this book has the unexpected and its content is very diverse. Jack Zipes did an excellent job in choosing the best modern fairy tales by contemporary writers. Each story gives a singular taste of the respective author's writing style, and the bibliography at the end is helpful in case you want to pursue a particular tale to its source. Secondly (and most importantly), it is the fairy tales themselves—they have so much to offer. Some of them always reach out and grab my heart, while others are hilarious renditions of classics that make me think twice about common ideas and modern notions. Remember the character of Little Red Riding Hood and how nonsensical she was when dealing with that wolf? How about a clever Red Riding Hood instead, like the young heroine of Little Polly Riding Hood who outwits the wolf even in a modern setting? Then there's Princess Dahli, where a poor princess and a poor prince both have to live through the story of Cinderella and snub their wicked relatives before they can realize that they're meant for each other. Gudgekin the Thistle-Girl, The Cat-King's Daughter, Molly Mullett, and Petronella are more examples of stories in this anthology that have some things in common. Smart and resourceful heroines take charge of classic fairy tale scenarios and get themselves (and their kingdoms if necessary) out of trouble, occasionally learning a few lessons and administering the best doses of fairy tale humor. I mean, how many fairy tales feature a princess who rescues the prince herself and ends up marrying an enchanter or who tricks her father the king into approving her engagement to a dismissed suitor? Of course, the book also has tragic fairy tales—The White Seal Maid and The Dark Princess are two of the most dramatic. Sad and very romantic in their own way, these stories make bold statements and reflect on how life is not a fairy tale and does not always have happy endings for its participants. Even if I have my favorites among the fifteen tales that are in The Outspoken Princess and The Gentle Knight, I still like all fifteen in different ways. Ernest Hemingway's The Faithful Bull is a poignant fairy tale that I can't forget to read, as are the two title stories. 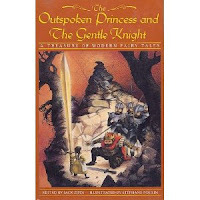 The Outspoken Princess and The Gentle Knight has romance, wit, charm, and action—it's one of the most irresistible modern storybooks I have ever come across, and it does, as its title suggests, speak for itself. This sounds like a wonderful collection! I'm such a fan of fairy tales and retellings. Thank you, Natalie, for this wonderful review! I'll get on my library's website right now and put this book on hold.